Andy Warhol’s entire oeuvre could arguably be reduced to a single iconic image: the soup can. 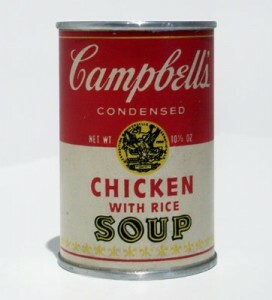 It is surprising, then, to learn that since the artist’s legendary 1962 exhibition of thirty-two Campbell’s Soup Can paintings at Ferus Gallery in Los Angeles, no museum or gallery has focused exclusively on the subject. 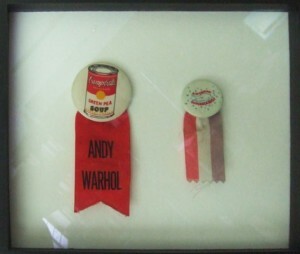 While a 1970–71 traveling retrospective devoted a section to the cans, only this exhibition—a small, tight collection at Armand Bartos titled Warhol Soup and encompassing prints, paintings, multiples, and ephemera—demonstrates how the Pope of Pop developed a singular idea into an artistic assembly line over three decades. 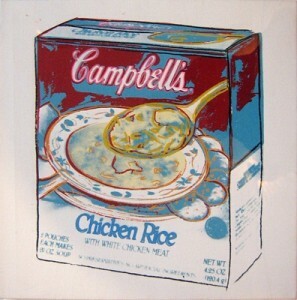 Campbell’s Soup I (1968), a suite of ten screenprints on white, easel-size sheets, hang side by side on the gallery’s longest wall. They are crisp, flawless, and nearly identical, with only the indication of an individual can’s contents (Green Pea, Pepper Pot) distinguishing one print from the next. 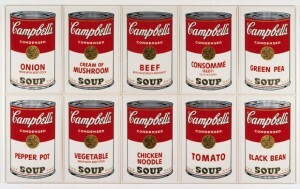 Because their straightforward red, black, and gold colors contrast with the jarring combinations of tangerine, fuchsia, and mustard from Warhol’s other mid-1960s works, the Campbell’s Soup I prints perhaps represent a “return to reason” for the artist in the year the Factory took a businesslike turn after leaving its original midtown location—and also after Warhol was shot and nearly killed. 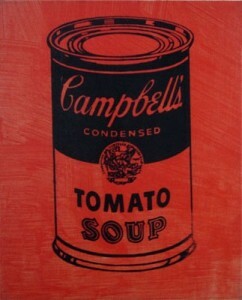 The charm of Campbell’s Tomato Soup (Red) (1985) lies in the slightly tilted, black-outlined can on a small canvas with streaked paint mimicking the runniness of soup. Two product labels for Chicken with Rice—not made by the artist but procured from the company in 1965 and signed “A. 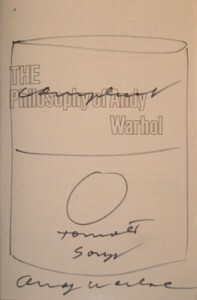 Warhol”—complement the same label inked onto a solid cast aluminum cylinder from 1966. The exhibition’s most mysterious—and unique—object is a Polaroid from the opening of Warhol’s 1971 Tate retrospective. 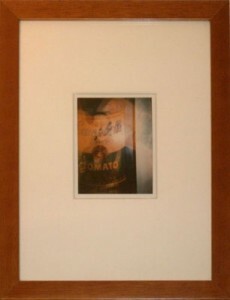 The double-exposed image overlays an anonymous, androgynous figure holding a cigarette on top of a black Campbell’s Soup Can painting. Permeated with an orange glow, the image perfectly embodies how Warhol entwined glamour and the commonplace. 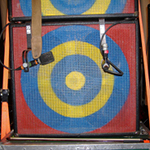 Originally published at Artforum.com on March 5, 2011.